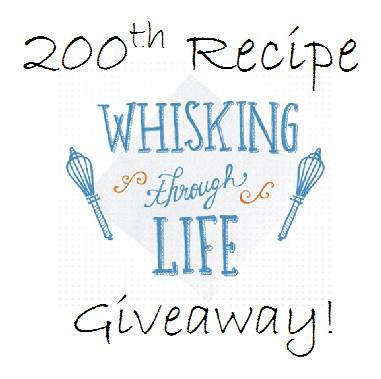 Okay, so WOW....The next recipe I bake will be my 200th! So, to celebrate, I am going to send one lucky person a delicious treat! All you have to do is leave me a comment on this post telling me what your all-time favorite dessert is between now and this Friday, June 14th and someone will be sent a cookie or bar based off that dessert. (If you want two entries...like me the post on my facebook page) I can't wait to hear what everyone loves! My favorite is a tie between...cinnamon rolls or carrot cake. Okay so I am totally not one to buy cake mixes anymore. Don't get me wrong boxed cake mixes taste great and are what I grew up on, but they are won't of those things on my grocery list anymore. This gluten-free cupcake mix was a gift so I could test it out, since there are three gluten-free individuals in my office. This mix from William-Sonoma is made with a base of Thomas Keller's Cup4Cup gluten-free flour, which you can also buy at W-S. The vanilla flavor, according to the container, come from "aromatic Madagascar Bourbon vanilla bean". This mix is super simple in that all you have to do is add melted butter, eggs and milk. I however wanted to put a spin on them, since they are a boxed cupcake mix. I browned the butter, because well nothing beats that flavor. I also add extra vanilla bean seeds from half of a vanilla bean. Now for the frosting. The package recommends making a vanilla buttercream frosting, however I was making these for someone I knew had been craving chocolate recently. Instead of the vanilla buttercream, I went with a chocolate cream cheese frosting. Overall this mix did turn out delicious. Unlike some gluten-free mixes I have tried in the past, and well gluten-free cupcakes from bakeries, these cupcakes came out light, moist and fluffy. If you have just the few extra minutes, I would totally recommend browning the butter, nothing beats the flavor and it adds a more grown-up flavor to the cupcakes. Just pick your frosting of choice and few will be able to tell these cupcakes are gluten-free. This cupcake mix is a little pricey at $16.50 a package, since it only makes a dozen cupcakes, but it perfect for any non-baker who is gluten-free or has gluten-free friends. Plus is also comes in Red Velvet and Chocolate! 1. In a large mixing bowl, using a mixer, cream together the butter and cream cheese until light and fluffy. 2. Mix in the vanilla extract, cocoa powder, milk and salt on low until well blended. 3. Gradually add 11/2 cups powdered sugar on low speed until creamy. Then add in the remaining powdered sugar. If the frosting seems dry add and extra 1 teaspoon of skim milk. Frosting the cupcakes once they have cooled completely, serve and enjoy! A tossup between White Chocolate Macadamia Nut cookies or German Chocolate Cupcakes!